Industrial Brush Company offers a complete line of Nylon and Wire Brushes used in the Food, Pharmaceutical and Bakery industries. 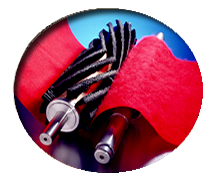 We have over 70 years of experience supplying Cylinder Brushes for the most demanding applications. Our "Fineset" Bristle Pattern uses an adhesive to bond individual strands of 6:12 Nylon to our metal core. This adhesive forms a solid, non-porous base that rejects foreign contaminates. This eliminates build-up at the base of the bristles and also combats bacteria formation on the brush. Encapsulating the core with adhesive rejects liquid seepage and is impervious to most liquids and chemicals. The full uniform density of our “Fineset” design optimizes performance, extends life, and reduces contamination by eliminating openings that are found in typical coil wound brushes. Our “Fineset” brushes are in use in the Pharmaceutical industry to move, level, or meter pills and capsules. Each brush is designed to fit specific shape and hardness requirements. FDA Color Nylon is an excellent choice for tracking product specific use of brushes on different processing lines. Bristle retention is ensured with our patented adhesive bonding method of securing bristle. 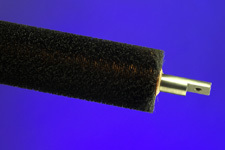 Many OEM suppliers of pharmaceutical packaging equipment use “Fineset” brushes exclusively. When operating temperatures do not allow for the use of Nylon brushes, our Double Band Wire brushes are an excellent option. 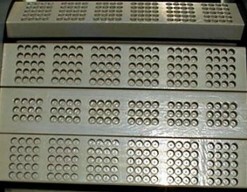 We offer Carbon Steel and Stainless Steel bristles in wire sizes from .006” to .025”. This allows us to design brushes that will clean oven bands, wire mesh belts and oven pans without damaging them. We can vary the density of the brush to limit grease, crumbs and baked on product that build up on the dense wound brushes. 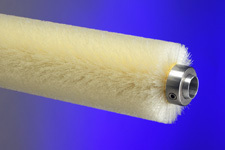 Our extensive core building capabilities make Industrial Brush an excellent choice for new and replacement brushes.